The Engineering teleporters are pretty cool, and one of the key reasons I kept Engineering. And as strange as it may sound I like that every now and then they go wrong. You can be pop’ed in the air to potentially fall to your death (parachute cloak FTW), come out as a monster, a shade of half yourself, or even you evil twin. Yesterday I saw my paladin’s evil twin. All quasi-translucent and red. Like a Shadow Priest, but full of red rage. 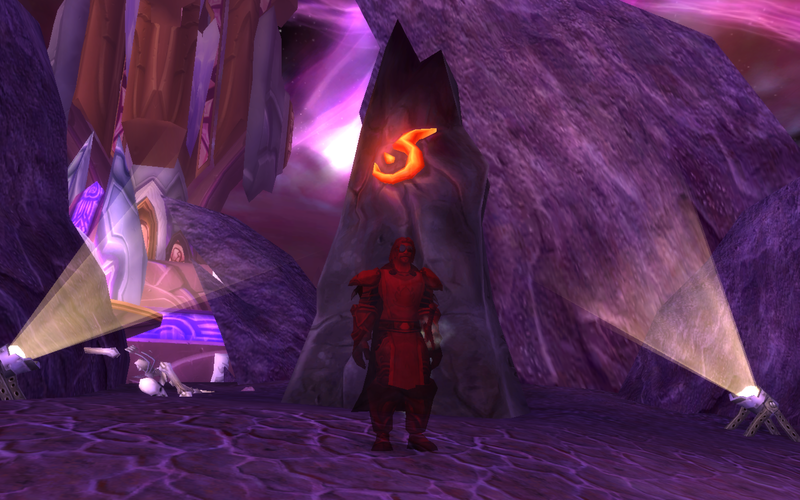 This entry was posted in Warcraft and tagged engineering, evil twin, Paladin by Typhoonandrew. Bookmark the permalink. Are the teleporters just for students of Gnomish engineering? I do Goblin and so far haven’t been offered any schematics that allow me to do it, which seems weird because don’t the teleports lead only to the Goblin towns? Both Gnome and Goblin have the teleporters, but they go to different locations. Gnomish items are Transporters and Goblin are Dimentional Rippers, with one device for old world and one for outland. Goblin: Everlook, and Area 52. Gnome: Gadgetzan, and Toshley Station.